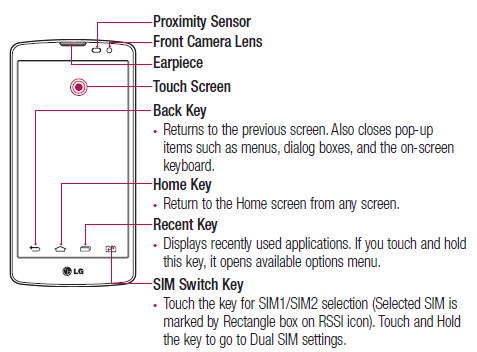 The LG L Bello Manual is ebook guide that contain many instruction to operate the phone. For example tutorial how to Installing "LG PC Suite" PC Software? Then about troubleshooting. It's available in PDF format and english language. The LG L Bello user manual consist of 109 pages. It's devided into 18 section. The manual is proivde detail reference informtion such as Touch screen tips, Customizing the Home screen, Using Dual SIM, how To set up your Google account, Connecting to Networks and Devices, Wi-Fi Direct, using bluetooth, call settings, using camera and video. Then about QuickMemo+, QSlide, LG SmartWorld, using internet, using google+, Recording a sound or voice, PC software (LG PC Suite), Phone software update, Accessories, Troubleshooting, FAQ, and more.